Sabellidites cambriensis is an animal that we know only from the fossil record. Metazoans (multicellular animals) evolved during the Ediacaran Period as shown by the record of their imprints, carbonaceous compressions, trace fossils, and organic bodies and skeletal fossils. Initial evolutionary experiments produced unusual bodies that are poorly understood or conceived of as non-metazoan. It is accepted that sponges, ctenophorans, cnidarians, placozoans, and bilaterians were members of the Ediacaran fauna, many of which have uncertain affinities. The fossil Sabellidites cambriensis Yanishevsky, 1926, derived from the terminal Ediacaran strata, is the earliest known organically preserved animal that belonged to a newly evolving fauna, which replaced the Ediacara-type metazoans. Morphologically simple soft-bodied tubular fossils, such as S. cambriensis, and biomineralized, as contemporaneous Sinotubulites sp., are not easy to recognize phylogenetically because many unrelated organisms developed encasing tubes independently. Therefore, in addition to morphologic information, evidence derived from the microstructure of the organic wall and its biochemistry may be vital to resolving fossil origins and phylogenetic relationships. Here we present morphological, microstructural and biogeochemical studies on S. cambriensis using various microscopic and spectroscopic techniques, which provide new evidence that supports its siboglinid, annelidan affinity. The late Ediacaran age of Sabellidites fossil constrains the minimum age of siboglinids and the timing of the divergence of including them annelids by fossil record and this could be tested using molecular clock estimates. The fine microstructure of the organic tube in Sabellidites is multi-layered and has discrete layers composed of differently orientated and perfectly shaped fibers embedded in an amorphous matrix. 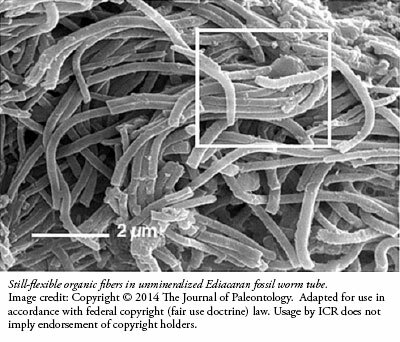 The highly ordered and specific pattern of fiber alignment (i.e., the texture of organic matter) is similar to that of representatives of the family Siboglinidae. The biogeochemistry of the organic matter that comprised the tube, which was inferred from its properties, composition, and microstructure, is consistent with chitin and proteins as in siboglinids.